The Bombers will field a team in the VWFL's inaugural season this year. Essendon Football Club is proud to announce it will field a team in the inaugural Victorian Wheelchair Football League. 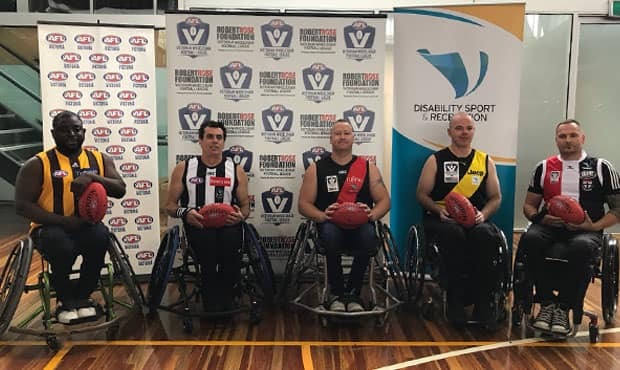 The formation of the VWFL, in partnership with the Robert Rose Foundation, is the first opportunity people with a physical disability will have to play AFL in a regular competition. In conjunction with Disability Sport & Recreation, the new league will focus on promoting social inclusion and allow more Victorians to enjoy the benefits of physical activity. CEO, Xavier Campbell, said the Club was excited to be part of the new competition. “This is a fantastic initiative and we are proud to be one of the foundation clubs of the VWFL,” Campbell said. Essendon’s inaugural VWFL Captain, Louis Rowe, was also unveiled at today’s Launch. A motorbike accident in 2007 ended Rowe’s football career, but the discovery of wheelchair football has reignited his competitive streak. “I played footy all my life, played for Old Xavs but in 2007 had a motorbike accident in Thailand and was forced into retirement,” Rowe said. The VWFL season is run over ten-rounds between May and August, with the Grand Final to be played in September during the AFL Bye-Round. Five teams will take part in the competition including Collingwood, Hawthorn, Richmond and St. Kilda. The VWFL will see two teams of five players each take to a basketball court, with a handball the equivalent to a kick and an underarm throw comparable to a hand pass as per traditional AFL. The competition is open to anyone with a physical disability, people with mobility issues as well as able-bodied people who are interested in getting involved. Round One of the VWFL season will commence on Sunday May 6 at Boroondara Sports Complex. For those interested in the VWFL, please contact AFL Victoria AAA and FIDA Football Manager Scott Nicholas at scott.nicholas@afl.com.au.